Hidden Creek Lodge offers a getaway stay in Hocking Hills. Cbus Chic: What is Hidden Creek Lodge? Chris and Taylor, Owners of Hidden Creek Lodge: Hidden creek Lodge is a privately owned year-round vacation rental managed by Buffalo Lodging Company. Cbus Chic: What makes Hidden Creek Lodge unique? Chris and Taylor: The lodge sits on 10 private wooded acres which allows guests to go for a hike right on the property. It is only minutes away from Ash Cave, Old Man’s Cave and Cedar Falls—Hocking Hills’ biggest attractions. Hidden Creek Lodge gives guests the feeling of being completely secluded with all the modern amenities for a comfortable stay. Cbus Chic: Can you give us price points for a stay? Chris and Taylor: Nightly rates differ depending on the time of the year and holidays but range from $299-$499. Cbus Chic: What are some of the amenities available at the lodge? Chris and Taylor: Hidden Creek Lodge offers 3 bedrooms (1 king, 2 queen), a sleeping loft with 5 single beds, and two queen sleeper sofas to accommodate 15 guests. Guests will have a fully stocked kitchen, along with a grill to accommodate all cooking needs. Wrap around decks offer plenty of space for group meals or a place to relax away from the crowd. An eight-person hot tub with a beautiful view of the 10 private wooded acres is the perfect spot to enjoy a morning coffee or a cold adult beverage after a long day of hiking the nearby trails. Enjoy a fire either at the backyard pit or in the stone fireplace located in the main living room. The Lodge offers satellite TV and is a great spot to host a gathering to watch the game, along with a full-size pool table and Bluetooth stereo for your music. 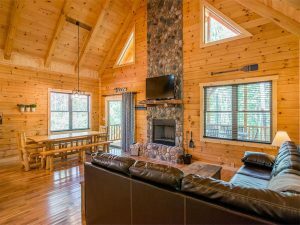 The Lodge has everything you need for a great vacation! Cbus Chic: What makes Hidden Creek Lodge a good place for a weekend getaway or vacation? Chris and Taylor: Hidden Creek Lodge is in the heart of Hocking Hills, and only a short trip from many major cities like Columbus, Cleveland, Cincinnati, Indianapolis and Pittsburgh. Whether you are looking for a relaxing vacation in the woods or an adventurous trip, the Hills have something for everyone. Our friends at Soaring Cliffs offer an amazing zip line adventure, or kayak/canoe the river for some time on the water. 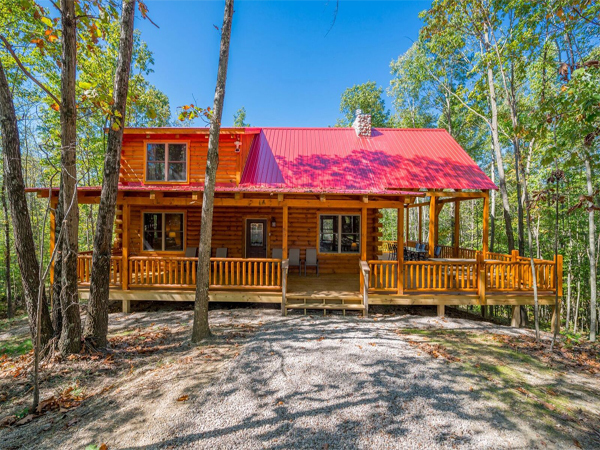 Hidden Creek Lodge and the Hocking Hills region are perfect for groups and families, feel free to contact us for recommendations prior to your trip! Cbus Chic: Is there anything new on the horizon for the Lodge? Chris and Taylor: We hope to introduce a new Lodge soon for our followers to enjoy. We would love to hear from our guests about what we can do to make their next trip to the Hills even better. Watch our Instagram page for giveaways from some of our favorite vendors. Chris and Taylor: Follow our Instagram or Hidden Creek Lodge on Facebook for updates, specials, and our personal Hocking Hills adventures. To view lodge details, photos, online booking, and availability, click here.